Three days, five schools...this is Right To Play, Jordan. 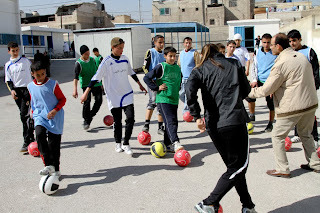 Young people under the age of 29 represent 70 per cent of Jordan’s population. 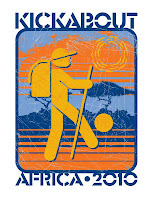 These children and youth experience the threat of poverty and unemployment, and lack of activities that provide respite from the difficult conditions they face in refugee camps and disadvantaged communities. 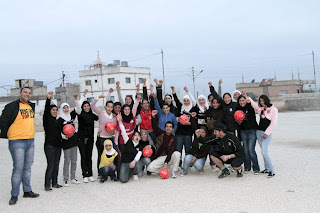 Right To Play’s intervention among refugee and disadvantaged communities in Jordan focuses on training teachers and staff of partner organizations to implement specially designed sport and play programs that provide psychosocial support, increase knowledge of healthy lifestyle behaviours, and provide youth leadership skills and opportunities for community participation. 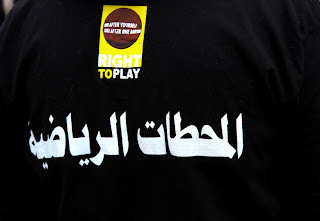 6 comments: on "Kickabout: Right To Play Jordan"